The polycystic ovarian syndrome treatment market in the U.S is highly competitive due to the presence of many local manufacturers and prevalence of low-cost generic drugs. However, manufacturers of brands in the country have strategically maintained their position in the market, owing to the unique value proposition and comparatively lesser side effects. The analysts of Persistence Market Research, while drafting a report on the U.S. polycystic ovarian syndrome treatment market titled “Polycystic Ovarian Syndrome Treatment Market: U.S. Industry Analysis and Forecast, 2016–2024,” have observed that alliances with e-commerce partners and distribution agreements with strong local players is the key market strategy that is being followed by leading players in this market. While concentrating on target geographies, the analysts have further observed that the U.S. is a highly mature market where manufacturers are focused on developing advanced direct first line therapeutics for the treatment of polycystic ovarian syndrome with fewer side effects. Similarly, companies are also entering into strategic agreements with distributors and local players to increase the availability of their products in order to expand their market footprint. After a detailed study of the U.S. polycystic ovarian syndrome treatment market, the analysts have found that the U.S. shows a high prevalence rate of polycystic ovarian syndrome. This syndrome is associated with several other conditions such as type 2 diabetes mellitus, obesity, hirsutism and others. Also, women with polycystic ovarian syndrome are at a greater risk of developing type 2 diabetes mellitus. According to the report, the U.S. polycystic ovarian syndrome treatment market comprises several pharmaceutical drugs manufacturers based in the U.S. However, due to lack of FDA approved drugs for PCOS treatment, the market is dominated by small generic drugs manufacturers. These companies follow strong marketing and distribution strategies for facilitating a higher adoption of their polycystic ovarian syndrome treatment drugs across the country. The U.S. polycystic ovarian syndrome treatment market report begins with an overview of the entire market. 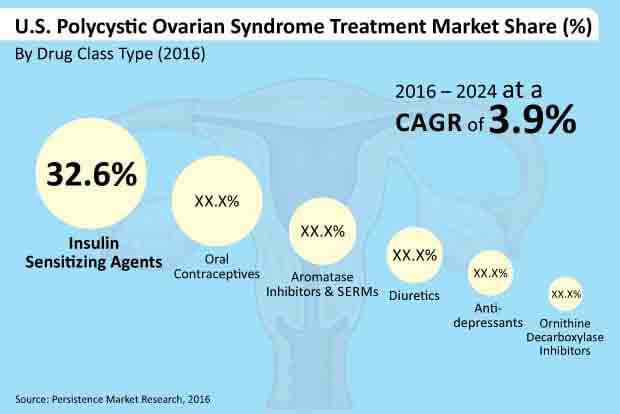 The report also underlines factors influencing the growth of the U.S. polycystic ovarian syndrome treatment market along with a detailing of the key trends, drivers, restraints, opportunities for market players and regulations. Impact analysis of key growth drivers and restraints based on the weighted average model along with important trends is included in the report to better equip clients with information and hidden insights. At the end of the report, Persistence Market Research provides key strategic recommendations for both existing and new players in the market to emerge sustainably profitable. A detailed analysis has been provided for each market segment in terms of market size, Y-o-Y growth rate, absolute $ opportunity, market attractiveness index and BPS analysis. The next few sections provide a detailed analysis of every segment and sub-segment of the U.S. polycystic ovarian syndrome treatment market. The report further highlights the growth trends of the polycystic ovarian syndrome treatment market across the U.S and presents a market outlook for 2016–2024 – showcasing key trends contributing to the growth of the polycystic ovarian syndrome treatment market in the U.S. as well as an analysis of the extent to which drivers are influencing this market. The final section of the report includes detailed company profiles with company-specific long-term and short-term strategies, key offerings, and recent developments in the U.S polycystic ovarian syndrome treatment market. The report considers 2015 as the base year and provides data for the forecast period 2016–2024. To deduce market size, the report considers various viewpoints based on extensive primary and secondary research. The report begins by sizing the current market – a key indicator of how the market is likely to grow during the forecast period. Given the characteristics of the market, the report presents triangulated data on the basis of supply side and demand side analysis and other dynamics of the U.S polycystic ovarian syndrome treatment market. Indicators such as the number of polycystic ovarian syndrome patients per year, diagnosis rate, treatment rate, etc., have been considered to arrive at the indicated market numbers. Similarly, historical trends pertaining to the demand for drugs among polycystic ovarian syndrome patients have been analyzed to track data. Yearly change in inflation rate has not been factored while forecasting market numbers. Bottom-up approach has been used to assess market numbers for each product category, while top-down approach has been used to counter-validate the reached numbers. The insulin sensitizing agents drugs class segment is estimated to lead in terms of revenue contribution to the U.S. polycystic ovarian syndrome treatment market and is estimated to account for a little more than 30% market share by the end of 2024. The segment is likely to be valued at over US$ 75 Mn in 2017 and is expected to reach close to US$ 100 Mn by 2024 end. Currently, around 70% of polycystic ovarian syndrome patients are overweight and prone to type 2 diabetes. Thus, insulin sensitizing agents are the most widely prescribed drugs for polycystic ovarian syndrome treatment. Insulin sensitizing agents drug class segment is expected to reflect a market attractiveness index of 2.0 over the estimated period. The segment is anticipated to create absolute $ opportunity of close to US$ 3 Mn in 2017 over 2016. Increasing healthcare expenditure is being witnessed in many developed countries worldwide including the U.S. This indicates that people have become more health conscious and hence are increasingly inclined towards enhanced treatment options for various ailments. This is one among the primary factors driving the growth of the insulin sensitizing agents drug class segment. Polycystic ovarian syndrome associated diseases, especially obesity and insulin insensitivity are increasing; however, the exact cause of polycystic ovarian syndrome is so far unknown and there are no drugs approved for direct treatment of polycystic ovarian syndrome. However, associated conditions can be controlled with drugs such as insulin sensitizing agents. Thus, an increasing need for associated disease management is expected to contribute significantly to the growth of the insulin sensitizing agents drug class segment. Also, rising R&D expenditure and an introduction of novel drugs is expected to fuel market growth of the insulin sensitizing agents drug class segment over the forecast period. Companies in the U.S are currently focusing on research and development of novel drugs to enable better management of associated diseases such as obesity, insulin sensitivity, hirsutism etc. Besides, polycystic ovarian syndrome drugs manufacturers are focusing on the commercial distribution of medicines through retail pharmacies and online portals. Online portals widely distribute polycystic ovarian syndrome drugs with or without prescription. Moreover, consumers can avail discounts on bulk purchase of medicines through online portals. Hence, easy availability and discounts contribute significantly to increasing adoption of insulin sensitizing agents. The development of the insulin sensitizing agents drug class segment is also attributed to increasing disposable income and improving healthcare facilities in the U.S. The growth of the segment is further credited to several awareness programs initiated by the U.S government. Drugs used for polycystic ovarian syndrome are not covered in most coverage policies or health insurance. The cost of few drugs are comparatively high in the U.S. Thus, reduction in the cost of branded drugs would help in the adoption of polycystic ovarian syndrome drugs across the globe. Currently, only Metformin, an insulin sensitizing agent has been included in the list of reimbursed medicines. Taking into consideration the high cost of insulin sensitizing agents in various countries such as the U.S., polycystic ovarian syndrome drugs could be covered under reimbursement policies, which would help propel the growth of the insulin sensitizing agents drug class segment. Players in the U.S polycystic ovarian syndrome treatment market are likely to benefit through higher investment by government authorities and funding agencies for the development of new drugs for the treatment of polycystic ovarian syndrome. Currently, there are no drugs approved by FDA and EMA for polycystic ovarian syndrome, thus drugs manufacturers are being presented an opportunity to hold significant share in the market. In addition, the patient population of diabetes is expected to increase at a high rate due to a sedentary lifestyle. As a result, the demand for branded drugs is expected to increase significantly over the predicted period.